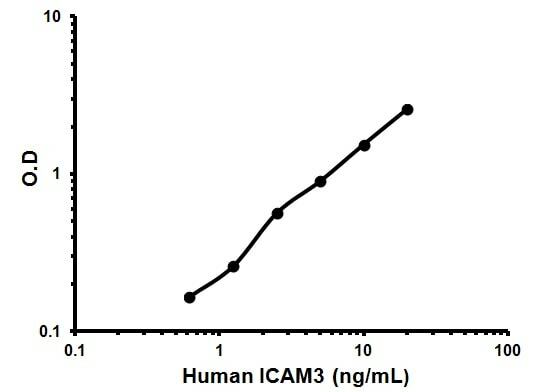 Abcam’s ICAM3 (CD50) Human in vitro ELISA (Enzyme-Linked Immunosorbent Assay) kit is designed for the quantitative measurement of ICAM3 in serum, plasma, buffered solutions and cell culture medium. A monoclonal antibody specific for ICAM3 has been coated onto the wells of the microtiter strips provided. Samples, including standards of known ICAM3 concentrations, control specimens or unknowns are pipetted into these wells. During the first incubation, the standards or samples and a biotinylated monoclonal antibody specific for ICAM3 are simultaneously incubated. After washing, the enzyme Streptavidin-HRP, that binds the biotinylated antibody is added, incubated and washed. A TMB substrate solution is added which acts on the bound enzyme to induce a colored reaction product. The intensity of this colored product is directly proportional to the concentration of ICAM3 present in the samples. This kit will recognize both endogenous and recombinant Human ICAM3. ICAM3 is a member of the intercellular adhesion molecule family. All ICAM proteins are type I transmembrane glycoproteins, contain 2-9 immunoglobulin-like C2-type domains, and bind to the leukocyte adhesion LFA-1 protein. ICAM3 is constitutively and abundantly expressed by all leucocytes and may be the most important ligand for LFA-1 in the initiation of the immune response. It functions not only as an adhesion molecule, but also as a potent signalling molecule. Our Abpromise guarantee covers the use of ab46024 in the following tested applications. ab46024 has not yet been referenced specifically in any publications. Publishing research using ab46024? Please let us know so that we can cite the reference in this datasheet. The expiration date that we assigned for that lot is October 2013. However, our guarantee is in effect for only 6 months after the purchase of the kit, so I recommend contacting us immediately if you have any issues with the performance of the assay. Is it necessary to use a glass vial for diluting the biotinylated antibody? Can plastic vial be used as well? The lab let me know that it is not necessary to use glass vials. Plastic vials suit perfectly. The crucial point is cleanness.